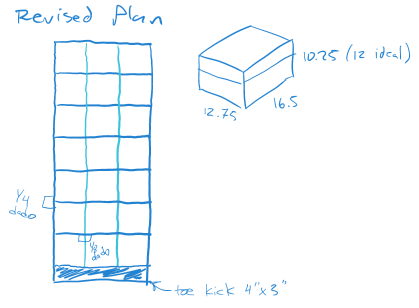 Ben’s initial sketch was nothing fancy, so he drew it up in Sketchup, and developed a full cutting plan. The entire shelving unit is 2 sheets of 23/32″ plywood and 2 sheets of 1/8″ MDF, both readily available at the local home improvement store. The instructions below are split into “cutting” and “assembly”. Without going into painful detail, you’re going to need some power tools to make this project happen. We used a table saw with a dado stack, a circular saw, an air nailer, and a router with flush trim bit, among other things. You could certainly get by with less, but these plans were made and instructions written given the tools we had available. Without further ado, the instructions. First, using a circular saw and straight-edge (if your table saw setup is big enough to make these cuts, go for it, but you probably don’t need my instructions – just print the cut list and have at it). Trim the end off of Sheet 1 at 90-1/2″ and set it aside. This offcut will become the toe kick, but we’ll make that cut later on a table saw for accuracy. 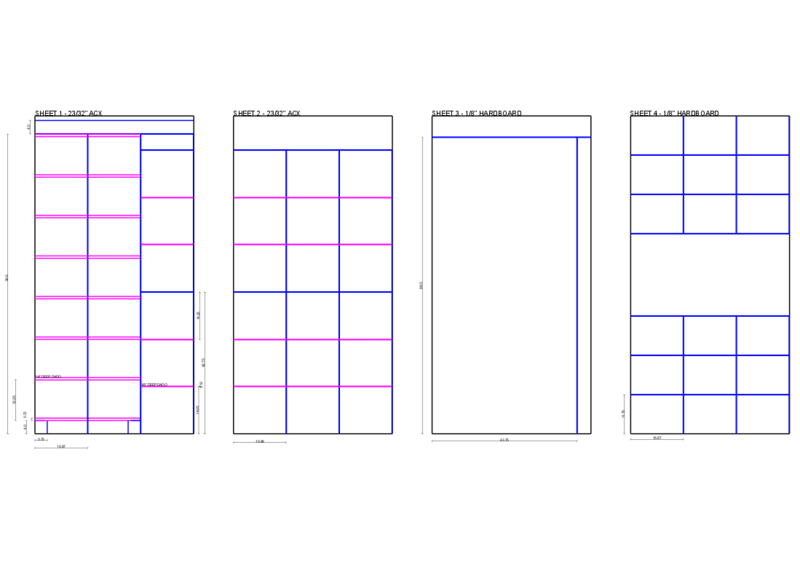 Cut Sheet 2 into two parts 42-3/4″ long, bringing the first six shelves to final length. Cut two sections off of Sheet 4 to become dividers. I chose to put the waste in the center and keep two factory edges, which means we can cut these pretty rough and clean the size up on the table saw later. Next, set the table saw fence to 15-7/8″. Once this is set, don’t move it until absolutely necessary – we’ll be switching around between tools for a bit, but when we come back to the table saw, we’ll want our parts to be exactly this same length. Use this setup to rip one pair of shelves out of Sheet 1 and six more shelves out of the pieces from Sheet 2. Cut the pieces of Sheet 4 into strips, being careful to orient the material correctly (at a glance it doesn’t take much to get the pieces rotated 90 degrees). Next, go back to the circular saw and cut the conjoined shelves from Sheet 1 to 42-3/4″ length. Mount a 23/32″ or 3/4″ bit in the router and set the cut depth to 1/4″. Cut the grooves across the side panels every 12-1/4″, starting with the bottom of the first groove 4″ from one end of the panels. This end is now the bottom. Back to the table saw, still set to 15-7/8″, and rip the side panels to their final width. We’re finally done with this fence setting. Now use the table saw to cut the divider panels to their final 11-3/4″ height. 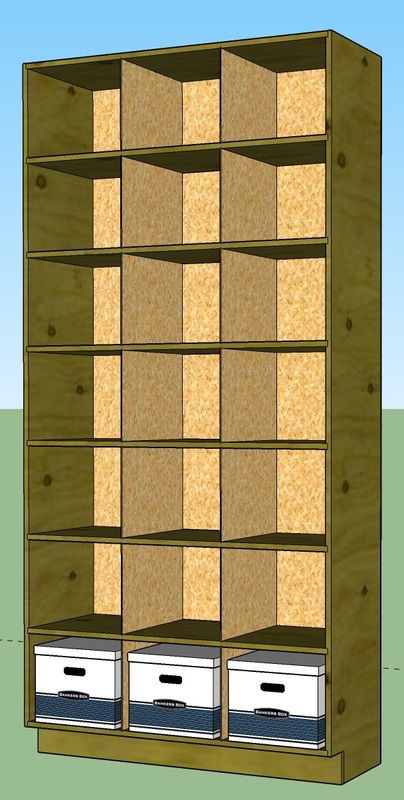 Now we need to cut 1/8″ wide, 1/8″ deep dados in the shelves, starting 14-1/4″ in from each end. Six middle shelves will be grooved on both sides, but the top and bottom shelves only need grooves on one side. We can do this with a 1/8″ kerf blade in a table saw, using a miter gauge to support the parts, or with a router and a 1/8″ bit. The router is probably the safer option, but those tiny router bits are expensive, fragile, and slow. Set the table saw for 4″ and turn the offcut from Sheet 1 into a toe kick. We’ll also want to cut it to 43-1/2″ length with a miter saw. Use a jig saw to cut a 4″ tall, 3-23/32″ deep (or 4″ deep for simplicity; nobody will know) notch into each side panel, making sure to make mirror images, not identical panels. Apply glue to the dados in one side panel, and stand it up on end. If you stand it face-down (with the toe kick notch to the floor), Step 8 will be easier. Nail or screw a shelf into one of the middle dados so the pieces will stand on their own. Insert the remaining shelves into that side panel and nail them in place. Position the second side panel and apply glue to the dados. Stand the second side panel up and start guiding the shelves into position. It helps to have a second set of hands for this. Nail the second side panel into the shelves. Measure the diagonals and bump the case into square, then take a break for the glue to start setting up. Apply glue to the back edges of the shelves and side panels. This is way easier if you built the shelf face-down. Drop the (still oversized) back panel into position and nail it in place all around the outside of the cabinet. Use a flush-trim router bit to cut the back panel to fit. Flip the cabinet over, then glue and nail the toe kick to the side panels and bottom shelf. Insert the dividers between shelves. This entry was posted in Hardware, How-To, Projects, Storage and tagged Shelves, Storage by Kevin. Bookmark the permalink.